A Wedding to Remember was a well deserved title for this wonderful event. 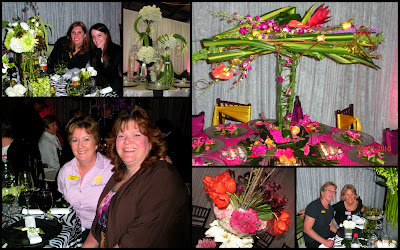 Each month Allied Florists of Houston gathers at one of the local wholesalers and puts on an amazing program with famous designers for a night of amazing food, beautiful flowers and most important; education. This month we were invited by Greenleaf Wholesale as one of the premier wedding florists of Houston to put together a table scape for their gallery. We gladly accepted the challenge and decided to go all out. We chose a fun a fresh color pallet with white, black and green and kept the arrangements very visually interesting with beautiful textures and contrast. Our table scape consisted of multiple pieces. First, we used 4 12x12 mirrors on the table and each mirror had a different type of arrangement. Each arrangement was in a square glass cube, just at different heights. 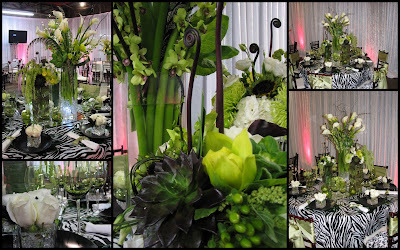 Using a variety of black, green and white flowers we created depth and interest with impact. Succulents, monkey tails, hypericum berries, lisianthus, roses, naked sunflowers, amaranthus, calla lilies and green dendrobium orchids were a few of the varieties we favored. Each place setting had a beautiful black tone on tone zebra print plates with a beautiful green tropical leaf to take the place of a traditional charger. Green wine glasses and personal rose arrangements made the table that much more stunning and unique. The gorgeous linens donated by Cathi at The Linen House added the finishing touch. It was truly a night to remember and we were proud to take part in a beautiful display of stunning designs.